(Nanowerk News) Doxorubicin, a drug commonly used to treat leukemia and other cancers, kills tumor cells by damaging their DNA. Though the drug is effective, it can also be toxic to heart cells. In 2005, the FDA approved a new type of doxorubicin, known as Doxil. In this new formulation, the drug is wrapped in a fatty coating called a liposome, which hinders its ability to enter heart cells (and other healthy cells). Doxil, usually prescribed for late-stage ovarian cancer, represents the first generation of cancer treatments delivered by tiny particles. Doxil particles are on the scale of millionths of a meter, but scientists are now working on nano-sized particles, which are measured in billionths of meters. Such particles could allow doctors to give larger doses of chemotherapy while sparing healthy tissue from dangerous side effects. Several nanoparticle drugs are now in clinical trials, and many more are being developed in research labs. These particles hold great potential to improve the performance of existing cancer drugs, says physician and engineer Sangeeta Bhatia, the Wilson Professor of Health Sciences and Technology and Electrical Engineering and Computer Science at MIT. "Chemotherapy and radiation and surgery are what we have now, but nanotechnology is emerging as an approach that complements the existing armamentarium of clinical tools to have a significant impact," she says. Liposomes were first discovered about 50 years ago, but more recently, scientists have realized that large synthetic molecules (polymers) such as polyethylene glycol (PEG) can be nontoxic and do not induce an immune response. PEG, which consists of a long chain of repeating units called ethers, can be attached to degradable polymers to form tiny, drug-delivering particles. Those particles are remarkably stable and can protect drugs from the body's own immune system, which otherwise might destroy them before they reach their destination. Around 15 years ago, scientists led by MIT's Institute Professor Robert Langer discovered that PEG also lends itself to chemical manipulation, allowing scientists to create customized drug-delivery particles. "As nanoscience began to evolve and we became adept at creating our own nanoparticles, we found ways to specifically design nanoparticles so they had properties we wanted," says Paula Hammond, the Bayer Professor of Chemical Engineering and member of the David H. Koch Institute for Integrative Cancer Research at MIT. For example, scientists can design particles to discharge their drug payload when they encounter acidic pockets inside a tumor cell. Scientists can also target nanoparticles specifically to attack tumor cells. There are two ways to do that — one passive and one active. In the 1980s, scientists realized that the blood vessels surrounding tumors have tiny holes, up to 500 nanometers in diameter, that allow small particles to flow from the bloodstream into the fluid surrounding the tumor. While that passive targeting gets nanoparticles to the right place, the particles wash away after about 12 to 24 hours, says Hammond. "If you want the chemotherapy to get closer to its target, then you need to do something to cause the cancer cell to take it up," she says. To that end, she and Bhatia are working on new ways to actively target nanoparticles by decorating them with molecules that bind to proteins found in large quantities on tumor cells. For example, they can attach proteins that bind to folate receptors, which are located in high density on cancer cells because the cells need large quantities of folate to produce new DNA as they divide. However, folate receptors are also found on healthy cells, in smaller numbers, so there is still a chance of unwanted side effects. To help overcome that obstacle, a collaborator of Bhatia's, Erkki Ruoslahti at the University of California at Santa Barbara, has pioneered a new way to screen libraries of proteins to identify ones that will bind exclusively to tumor cells. This approach has turned up hundreds of new candidates, says Bhatia, who is also a member of the Koch Institute and the Howard Hughes Medical Institute. Other nanotechnological approaches to cancer take advantage of the unique physical properties of some nanoparticles. 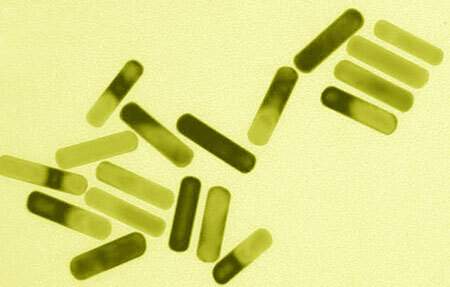 For example, gold nanoparticles absorb different frequencies of light depending on their shape. Rod-shaped particles absorb near-infrared light, which can pass through skin. Last year, Bhatia and one of her students, Geoffrey von Maltzahn, demonstrated that they could inject gold nanorods into mice, and that such nanorods would accumulate at tumor sites. Once the nanorods were in the tumors, the researchers heated them with near-infrared light, raising the temperature to 70 degrees C, hot enough to kill the tumor cells without damaging nearby healthy tissue. The technique can also be used to image tumor cells. Another promising application for nanoparticles is delivering RNA interference — tiny strands of RNA that can block cells from producing the proteins encoded by cancerous genes. Building on that idea, Hammond is now working on nanoparticles that would deliver a one-two punch, alternating layers of RNA and chemotherapy drugs. So far, Doxil is one of only two liposomal cancer drugs now approved in the United States, but other nanoparticle-delivered drugs are now in clinical trials. Clinical trials are expected to begin soon for nanoparticles engineered by Langer, a member of the Koch Institute, Harvard Medical School associate professor Omid Farokhzad and others. These nanoparticles will deliver the chemotherapy drug docetaxel to prostate-cancer patients. In animal studies, the particles showed a 20-fold increase in concentration at the tumor site with minimal side effects. As with any new type of medical treatment, researchers are also assessing safety risks. In the past few years, a new field of nanotoxicology has sprung up to investigate any risks nanoparticles might pose for humans. At the nanoscale, materials often take on new traits — for example, nanoparticles have a much higher surface-to-volume ratio than larger particles, which is important because most of their activity takes place on the surface, says Vladimir Torchilin, director of the Center for Pharmaceutical Biotechnology and Nanomedicine at Northeastern University. However, he says, clinical trials should reveal whether any given nanoparticle is safe or hazardous, just as they do for traditional drugs. "So far, it's pretty difficult to say, upfront, it could be dangerous because of that, that or that," says Torchilin, who is developing nanoparticles for cancer treatment. In 2007, an FDA task force on nanotechnology recommended that the agency form new guidelines to determine how to regulate nanotechnology products. In the meantime, clinical trials involving nanoparticles are proceeding just as any drug clinical trial would. PEG, which is the main component of many drug-delivering nanoparticles, belongs to the FDA category of substances "generally recognized as safe." Hammond is optimistic that nanotechnology will end up helping cancer patients, possibly within the next three to five years. "I think it provides way too many benefits for us to pull away from it," she says.